The trail encircling Hammil Lake offers tons of variety and is not to be missed. Over approximately 8 km, you’ll experience wide, open routes to narrow paths winding around trees; boggy lakeside mud, to sandy, sunny trails, and lush, moss-draped trees to sun-crisped scrubby rock bluffs. Pack a lunch, go for a swim to cool down in the summer heat, and enjoy your hike! The trail is wide and comfortable and you will cross a logging trail after about 20 minutes. Then you will see another four-way junction, with Fred’s Trail heading up on your left and Kneebanger Trail heading down to the lake on your right. Continue straight ahead. After 2 minutes, take the slight right turn toward the water to cross a little log bridge and continue on the trail. 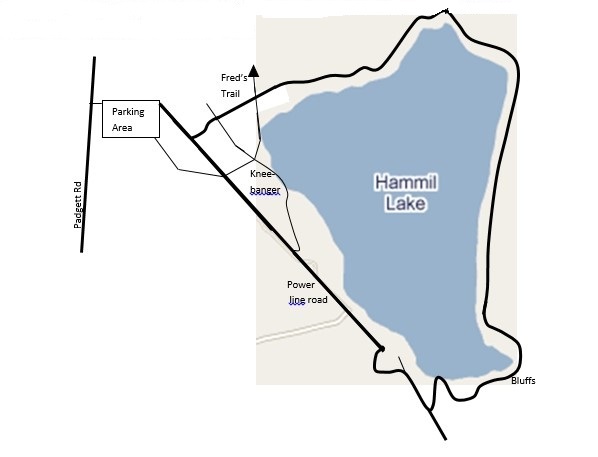 From there, you will be on the real Hammil Lake Trail, which is a narrow, varied, fun trail encircling the lake. After mounting the rock bluffs which mark the approximate ¾ point, you will come out onto a pole line road again. Turn right and follow it toward the lake, up and over the little hill and onto where it turns into a wide sandy road. After 10 or 15 mins on this road, you will see where the trail branches, and you can take either route back to your car. The left-hand route will continue along under the power lines on a rocky road. The right hand route will take you through a more treed area with access to one of the lake’s beaches where you can relax and cool off from your hike. At the top of Duncan Street, turn right onto Padgett Road. After about 2 minutes, look for the large power lines crossing the road. Turn left and park in the rocky parking area under the power lines. From the parking lot, begin your walk. You may be tempted to continue driving, as the rocky pole-line road does continue on, but it is best to leave your vehicle here. Begin walking along the upper road until you see the first trail turnoff to your left (about 2 mins).